Tonkawa Foundry, Inc. commended by peers for ingenuity and partnership. Tonkawa Foundry, Inc. was recently credited with the Honorable Mention Award for American Foundry Society's 2011 Casting Competition. The award winning casting was that for the foundry's PV 524 Fire Pot. 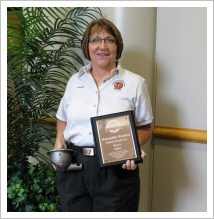 Tonkawa Foundry Chief Financial Officer, Sandy Linton Salsbury displays the prestigious award. Tonkawa, Okla. - Industry experts say that you are never more than ten feet away from a metal casting. Whether you are at home, at work, or even in your car some sort of casting is near. This is even now particularly true in your own back yard. Tonkawa Foundry, Inc. has been recognized for their recent custom design piece in Cookshack, Inc.'s wood-burning, pellet-fired smokers. Tonkawa Foundry's recognition came in the form of winning the Honorable Mention Award for American Foundry Society's 2011 Casting Competition. The award winning casting was that for the foundry's PV 524 Fire Pot. The Fire Pot is used in all of Cookshack's pellet fired units. The pellets slide down a shoot into the fire pot where they burn producing both the heat for the unit and the smoke to flavor the product. The Fire Pot design was a collaborated solution shaped by Johnny Thornburgh, Manufacturing Extension Agent; Jim Linnebur, Cookshack Production Manager; Stuart Powell, Cookshack President; and Don Reimer, Tonkawa Foundry Vice President of Foundry Operations. Pioneer Technology Center (PTC), Oklahoma Manufacturing Alliance and Northern Oklahoma College (NOC) sponsor Thornburgh as the local Manufacturing Extension Agent (MEA) to support the manufacturers in the northwest fourteen Oklahoma counties. According to Thornburgh, he saw the opportunity to connect two local manufacturers when Cookshack's Stuart Powell discussed the challenges of the fabrication of the Fast Eddy's smoker burner pot. The unit was a very costly, labor intensive stainless steel weldment that was composed of five separate pieces that had to be cut, drilled, rolled and welded. As Thornburgh and Powell conferred about possible improvements, Thornburgh thought Tonkawa Foundry might provide a solution. Tonkawa Foundry, Inc. had already been a partner of Cookshack, Inc. in the production of the cast iron grate for Cookshack's wood-burning pellet-fired charbroiler. Thornburgh and Powell visited Sandy Salisbury Linton, Tonkawa Foundry Chief Financial Officer and Don Reimer to see what it would take to convert the fabricated burner pot into a casting. Along with finding out how the process might work, Powell was interested in the potential time and cost savings for Cookshack. Thornburgh's expertise led to the awareness that the cast metals industry looks for assembly pieces that are constructed by welding processes, also known as "weldments", such as the burner pot, that lend themselves to becoming castings that can result in cost savings and increased productivity to the end user. Such was the case for the custom designed Fire Pot that is now used in eight different models of Cookshack cookers. The conversion of the stainless steel weldment burner pot to the cast iron Fire Pot resulted in significant savings of time and money for Cookshack, Inc. Powell commented, "This casting has saved us money and more importantly fabrication time. The cost of getting the parts cut, rolled, bent, welded and cleaned up was considerable." Cookshack will use about 1,000 of Tonkawa Foundry's Fire Pots per year that will equal a savings of almost $50,000 year. When asked about Tonkawa Foundry's award winning Fire Pot, Linton Salsbury, commented, "Our design went up against hundreds of entries that were very detailed. One reason the Tonkawa Foundry design stood out and won honorable mention was the way we brought 'casting' to an industry that didn't typically use it. Industries are not always aware of how they can use the casting process to save production time. We truly look for opportunities to partner with manufacturers to solve their fabrication challenges." Tonkawa Foundry, Inc. is a 61 year old family business in its third generation. The company has been a member of the American Foundry Society for several years. According to Linton Salsbury, "It is an honor to be recognized by our own industry peers. We couldn't do it if they (Oklahoma's local Manufacturing Extension Agents) weren't out there to help us. They don't toot their own horns enough. The funding that goes to work for Oklahoma manufacturers is a smart investment by the state of Oklahoma. Working with Johnny on the Fire Pot project not only saved Cookshack money, but it also made us money." The Oklahoma Alliance of Manufacturing partners with colleges and tech centers, like Pioneer Technology Center, to provide support to the state's manufacturers through engineering assistance, tax incentives, marketing assistance, and various training programs. Thornburgh added, "Local MEAs network and build partnerships between manufacturers to help maintain and expand their businesses and ultimately create more jobs for Oklahoma and the nation." Cookshack partnered with two other Kay County companies in the production of the redesigned Smokette and the new pellet-fired Charbroiler. K&C Manufacturing in Newkirk provided the production of the Smokette's control box and Tonkawa Foundry produced the heavy duty grill grates for the new Charbroiler. The partnerships were facilitated by Northwest Oklahoma's Manufacturing Extension Agent (MEA), Johnny Thornburgh. His position is sponsored by Northern Oklahoma College (NOC) and Pioneer Technology Center (PTC). 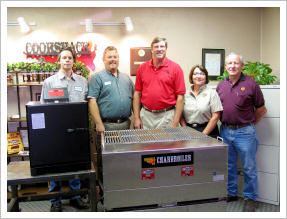 Partners and products pictured (left to right) include Kirk Brown, K&C Manufacturing owner; Johnny Thornburgh, MEA; Stuart Powell, Cookshack President; Sandy Salisbury Linton, Tonkawa Foundry, Inc. CFO; and Don Reimer, Tonkawa Foundry, Inc. Vice President of Foundry Operations; along with the Cookshack Smokette and Charbroiler. Ponca City, Okla. - Innovation, opportunity, success, and growth are terms rarely used to describe today's economic times. However, three Kay County manufacturers have found themselves less vulnerable to the ramifications of the nation's economic downturn by developing local partnerships. Johnny Thornburgh, Northwest Oklahoma's Manufacturing Extension Agent (MEA) sponsored by the Oklahoma Manufacturing Alliance, Pioneer Technology Center (PTC), and Northern Oklahoma College, has been working with Stuart Powell, President of Cookshack, based in Ponca City, in the development of some new products. Two such products included the redesigned Cookshack Smokette and the new Cookshack Charbroiler. In working with Powell on the development of these products, and by listening to and understanding Powell's needs, Thornburgh was able to match Cookshack product needs with local manufacturers' capabilities. Just over two years ago marked the beginning of the redesign for Cookshack's Smokette. About one year later, the design of the charbroiler began. Powell knew he needed better resources to produce their products. "It just so happened that I was complaining to Johnny one day [about the difficulty of finding certain product components], and he said 'Have you thought about contacting Kirk in Newkirk to do injection molding?' Kirk already makes some parts for us and I don't even know why I didn't think of calling him initially," reflected Powell. Thornburg commented "It sometimes takes someone that can look at companies from the outside, but still have industry knowledge to know how and when to make those matches. It's my job to help local manufacturers be better at what they do, to help them innovate, to improve their bottom line and to help them see that we want Oklahoma manufacturers to be successful." In this account, "Kirk" is Kirk Brown, the owner of K&C Manufacturing. K&C is a machine shop located in Newkirk. The outfit is a custom tool and die maker and specializes in plastic and metal fabricated parts. K&C currently produces the control box for the Smokette with the injection molding process. "The opportunity to start a new project was great. And what made it even better is that it is on-going work for K&C. This is the second project that has been facilitated by Pioneer Technology Center, NOC, and the Alliance. It proves to me that there is value in my investment as a taxpayer," remarked Brown. Powell followed by stating, "At Cookshack, we want to promote as much as possible that our products are 'Made in the USA.' When looking at the Smokette's controller, I was told that I'd need to have it made in China. But by having the right partners locally, we are able to keep work and dollars not only in the U.S. but in Oklahoma and even Kay County." The new Smokette was launched in January 2009. In the development of the Cookshack Charbroiler, it was important that it was equipped with heavy duty cast iron grills which distribute heat evenly, unlike some gas grills which use lightweight cast iron grates. To instill this quality in the Cookshack product, Powell was looking for a company to make custom grates for the charbroiler. That is where the partnership with Tonkawa Foundry, Inc. was developed. Tonkawa Foundry is a third generation company located in Tonkawa that specializes in iron based castings. Sandy Salisbury Linton, chief financial officer, noted, "Our customer base is spread across the nation. So, in some respects, it is nice to support other local Oklahoma manufacturers and put a project together that benefits both, the companies and the local economy." Tonkawa Foundry has created custom grill grates for the Cookshack Charbroiler that cost the same as a standard, mass produced version. The Cookshack Charbroiler project is the first time that Cookshack and Tonkawa Foundry have partnered. On behalf of Pioneer Tech, NOC and the Alliance, Thornburgh facilitated the partnership. According to Sandy Salisbury Linton, the foundry's Chief Financial Officer, "Johnny was the link that brought us together. Sometimes it's hard to find partners in Oklahoma, much less Kay County. Johnny served as a liaison for us. We [manufacturers] never had anyone who seemed to care or advocate for our industry until the Alliance, NOC and Pioneer Tech partnered. Our MEAs have not only helped us [manufacturers] with engineering, safety and LEAN efforts, but know us well enough to bring Oklahoma manufacturers together to create industry leaders." The new charbroiler was introduced in May 2009. The Cookshack Charbroiler is not only distinctive because it cooks food evenly and at the same rate no matter where placed on the grill, but it also uses "green" technology. It is the only commercial charbroiler that employs renewable energy by means of 100% wood pellets. Also, it is the only pellet-fired charbroiler on the market. "Having local partners makes it a lot easier on us to do business. If we need a part, it's as easy as going to Newkirk" remarked Powell. "Just by calculating the time we save by using local manufacturers, we have saved over $10,000 in product development. That doesn't even include the potential we can save on the production or even the customization we have received that will enhance our product's quality." "In dealing with today's business challenges, we sometimes forget to look in our own backyard for help. It makes me proud to work with companies from around here. The more we learn about each other here the more partnerships we will continue to have." Powell commented, "These partnerships exhibit local manufacturers working together and ultimately helping the community get through some tough economic times." It is apparent that these partnerships are win-win; not only for Cookshack, K&C Manufacturing, and Tonkawa Foundry, but also for Ponca City, Tonkawa, and Newkirk. These partnerships are not only beneficial to Kay County, but also to Oklahoma and even ultimately our nation. For more information about the Oklahoma Manufacturing Alliance or these partnerships, contact Johnny Thornburgh. His office is located at Pioneer Technology Center, 2101 North Ash Street in Ponca City, or call 580-718-4328. Tonkawa Foundry has earned the prestigious Governor's Manufacturing Leadership Award. Each year, Governor Mary Fallin bestows awards on a select few Oklahoma manufacturers in recognition of their pacesetting standards. The award-winning companies must be progressive, forward-thinking and willing to adapt to change to become more successful in their marketplace. "They represent the enormous potential available in Oklahoma and take a leadership role in promoting the importance of doing business in and from our state," said Chuck Prucha, president of the Oklahoma Manufacturing Alliance. "Tonkawa Foundry is a remarkable organization and has had an amazing impact on their community through its innovative growth." An awards committee made up of manufacturing professionals selects the winners from a long list of nominees. 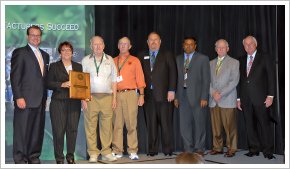 The awards were presented at the annual Oklahoma Conference on Manufacturing recently in Tulsa. Other winners were Forum Energy Technologies in Elmore City, Gabriel Ride Control in Chickasha, and Gunnebo Johnson in Tulsa. As the submersible pump industry began to exit the United States in the mid '90s, Tonkawa Foundry began to feel the pinch. "I watched our business go from a $4.5 million company to a $1.5 million company and we were barely keeping the doors open," says Sandy Linton. "We went from 45 employees down to 14. To survive, we had to totally reinvent ourselves." Linton serves as chief financial officer and is co-owner of the company her grandparents founded in 1950. Linton has worked hard to rebuild, refocus, and expand the family business, along with brother Jim and their father Gene. It hasn't been easy as American foundries continue to disappear. Luckily, manufacturing extension agent Johnny Thornburgh had an extensive background in the foundry industry and he didn't want to see another factory go under. Thornburgh is sponsored locally by Pioneer Technology Center and Northern Oklahoma College. He helped coordinate the transformation that is providing an economic boost to this Kay county area. The foundry is now poised to not only survive but thrive. With the help of Thornburgh and Rajesh Krishnamurthy, an Oklahoma State University applications engineer who works full time for the Manufacturing Alliance. Thornburgh identified a larger market Tonkawa could enter if it had more efficient ways to pour the 15 different alloys used in the foundry. Krishnamurthy designed an expansion plan that doubled the foundry's production capability. Also, the design -- coupled with more efficient equipment -- resulted in a net decrease in energy use. A new sand reclamation system created by Krishnamurthy is expected to reduce the foundry's energy demand by 8 billion BTUs per year. And, the system will reduce its emission of greenhouse gases and health-affecting pollutants by nearly one million pounds per year. Thornburgh was instrumental in securing a USDA grant and a local bank loan to finance the expansion. These changes are leading to a more diverse client base and will keep the foundry economically prosperous. As CFO, Linton likes annual sales pushing above the $4 million mark. But it's the smaller numbers that impress her even more. "The key to that is not just the number, but the diversification and versatility," she said. "If an industry fell apart or we lost some customers, we would be in a prime place to pick up other customers elsewhere. We are no longer dependent on one niche."